Vicenza is a small jewel of a city in the Veneto located half way between the cities of Verona and Venice; two spectacularly popular tourist destinations. The result is that Vicenza is often overlooked by visitors to this part of northern Italy. For those of you travelling between these two major tourist hubs, who would like to spend a day exploring someplace very different, I will take you on a spectacular walk through this small, easily accessible city. Before we alight from our train, let’s have a look at what makes Vicenza so special. 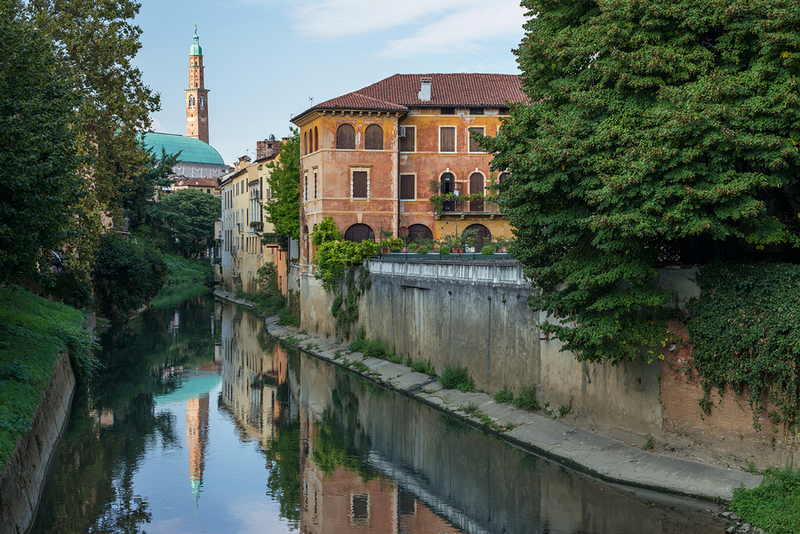 Known as the City of Palladio, this world famous architect made Vicenza his home and there is evidence of his presence just about everywhere you look. In 1994 the City of Vicenza and the Palladian Villas of the Veneto were proclaimed a UNESCO World Heritage Site and Andrea Palladio is justifiably considered to be the most influential western architect in history, as he created his own architectural style, known the world over as Palladianism. His iconic villas are scattered throughout the Veneto and I have been fortunate enough to have been able, while I lived there, to visit several of these Renaissance masterpieces. 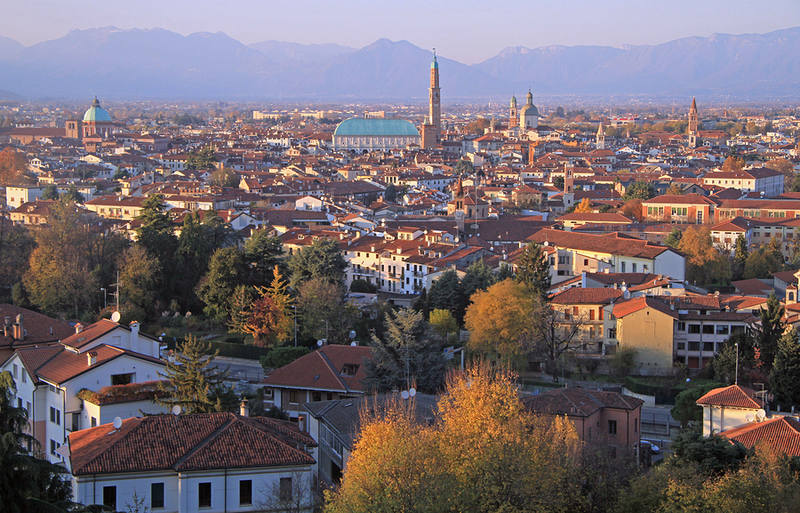 Vicenza has a population of about 115,000 and as the walled city centre is quite small, it is easy to get about on foot. Intersected by two tranquil rivers, the Bacchiglione and the Retrone, these are spanned by several bridges, most of them located in the centro storico (historical centre). 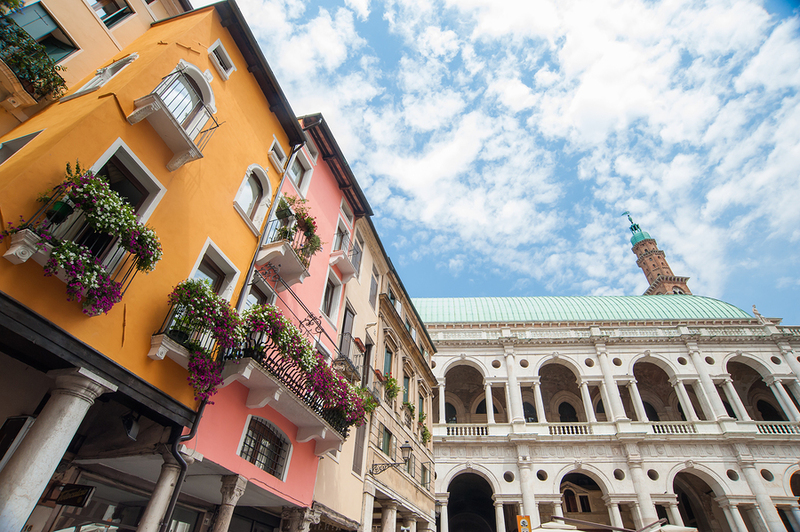 A prosperous city, Vicenza houses many goldsmiths and produces about one fifth of Italy’s gold jewellery, so it’s the perfect place to buy that special present! The first time I visited Vicenza – many years ago - the snow was deep underfoot and the sky was blue. I was well wrapped up in my long down-filled coat and fur-lined boots. Map in hand, I was keen to visit Monte Berico and, hopefully, Villa La Rotonda. I have since made this walk on countless occasions as I have been lucky enough to spend a great deal of time in this elegant city. Exiting the station, you will see Campo Marzo spread in front of you, cross Ponte Santa Liberta on your right and then head uphill towards the Santuario della Madonna di Monte Berico. This baroque church sits overlooking the Venetian Prealps, containing the many famous Italian ski resorts which are dotted throughout the South Tyrol. As you walk uphill, you will pass beneath 700 metres of arches designed by Francesco Muttoni in 1746 for pilgrims on their way up to the sanctuary. Take a look behind you at the city spread below and marvel at the sight of the duomo (cathedral) and the basilica rising above the myriad red roofs. Arriving at Piazzale della Vittoria, walk to the semi-circular balustrade in order to admire the stunning view of the mountains, always snow-covered in winter. Take time to enter the sanctuary, built in 1703 by Carlo Borella, and look skyward at the tall bell tower of Antonio Piovene. At this point it’s a nice idea to have a pit-stop at Al Pellegrino, the coffee shop opposite the church. In winter I enjoy their thick, sweet hot chocolate smothered in cream, but there is always the option of a bottle of water on a hot summer’s day to quench your thirst. Walking part of the way back down the hill, turn right down Viale Massimo d’Azleglio and along Via Bastion where you will arrive, after about fifteen minutes, at the gates of 17th century Villa Valmarana ai Nani. As this elegant villa organises guided tours, you might like to visit their website and book one, if you have the time. This very special villa boasts frescoes which were painted by Tiepolo himself and are well worth seeing. The first time I walked past this villa in the snow almost ten years ago, I was lucky enough to be able to take one of their excellent tours. Following the footpath past the villa, you will see the domed roof of Villa La Rotonda in front of you through the trees. It is very exciting to see this for the first time as you descend some wide steps and exit the path onto a narrow road. Turn right and almost immediately you will see Palladio’s masterpiece on your left. Hopefully, you will have checked out their website in advance in order to check on opening times. On my first visit I was crestfallen to find that it was closed after my snowy walk, but I have subsequently been lucky enough to take a private tour with none other than Niccolo Valmarana, one of the owners. We were privileged to be brought down to the basement of this temple-like villa to see how it was constructed without traditional foundations, but supported on 26 intersecting arches creating a honeycomb effect.The name ‘La Rotonda’ refers to the central circular hall with its eye-catching dome. 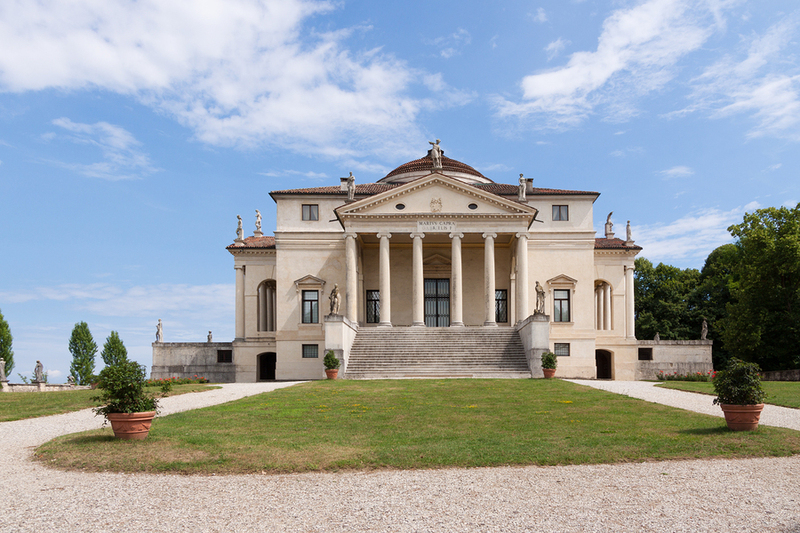 Building began in 1567, but both Palladio and the original owner, Paolo Almerico, died before the villa was completed and the final stages were presided over by the architect Vicenzo Scamozzi. One of the controversial changes he made to Palladio’s original plan was the modification of the central hall and dome. Heading downhill towards the main road into Vicenza, along Viale Riviera Berica, you will arrive in the city itself where you can enjoy a stroll along the banks of the two rivers, Retrone and Bacchiglone. A detour through Parco Querini with its little temple is always pleasurable, arriving shortly afterwards at the extraordinary Teatro Olimpico, a purpose built theatre, recognised as an architectural wonder, it was the last building designed by Palladio. He died before it was completed in 1585. The original trompe l’oeil street scenes which form the scenery is permanent and was designed, after the death of Palladio, by Scamozzi, Palladio’s successor, who also completed Villa La Rotonda. Strolling now past Palazzo Chiericati, yet another Palladian building and the home of the city’s main art gallery, you will now walk up Corso Andrea Palladio, past Palazzo Barbaran da Porto, where the museum of Palladio is housed. This is a must-see if you have time, as it has several detailed models of Palladio’s villas which are fascinating to study. Next stop is the splendid Piazza dei Signori, which is overlooked by such architectural delights as La Basilica Palladiana, whose façade was designed by Palladio, as was La Loggia del Capitaniato, the home of the city council and the mayor’s office, Palazzo del Monte di Pieta, Chiesa di San Vincenzo, Torre Bissara, the Lion of St. Mark and the iconic columns of Christ the Redeemer. Quite a dizzying array of striking architecture for sure. And looking down on all the hustle and bustle of the piazza is a statue of the great man himself, Andrea Palladio. After an aperitivo, or indeed lunch, in this magnificent piazza, it is time to revisit Corso Andrea Palladio and exit the centro storico via Porta Castello. Then turning left down Viale Roma, it is just a five minute walk back to the station, unless, of course, you have decided to extend your stay in this truly beautiful gem of an Italian city. Looking for fun activities while visiting the Veneto region? Check out our top picks here, handpicked for your next unforgettable vacation.